August 23, 2012 — Ethiopian tyrant Meles Zenawi passed away on Monday night from an infection, ending months of speculations of the former guerrilla fighter's health and whereabouts. The 57-year-old dictator was being hospitalized in Brussels for an unspecified illness that's thought to be liver cancer, before succumbing to an infection and dying shortly after. 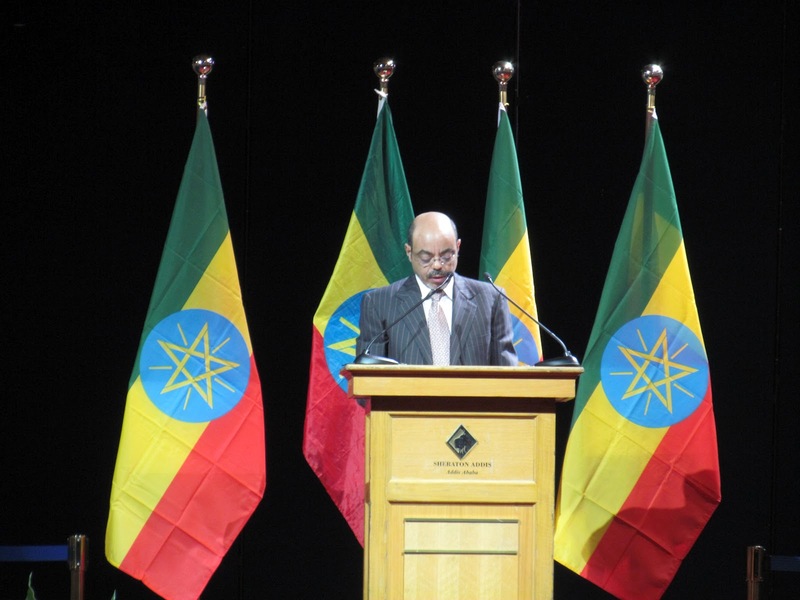 Meles' body arrived in the capital, Addis Ababa, on Tuesday night from Belgium, where TPLF bigwigs and party loyalist awaited him at Bole International Airport. Officials say he will stay at the National Palace until he's buried on Sunday, September 2. Government officials say the Deputy Prime Minister, Hailemariam Desalegn, will be sworn in as the acting prime minister until the 2015 period, when another round of fake elections are slated to take place. In the wake of the regime's announcement of the death of the former premier, reports indicate there is a palpable tension on in the capital and regional cities, particularly in Mekele and Gondar. ESAT is reporting service at government institutions crawled to a standstill. Citizens have been seen withdrawing money from banks in large numbers, while prices for staple products have increased significantly since his death. Amid the mourning for their fallen comrade, an intense power rivaraly is taken place underneath. Seyoum Mesfin is reportedly 'muscling' his way in to call the shots, while other officials are building up alliances to challenge his dominance. One source, who declined to be named for fear of reprisals, informed Durame by phone that once they bury Meles, senior officials will be arrested and charged with corruption, while party factions within the TPLF party will solicit Tigrayan army generals support against their rivals.